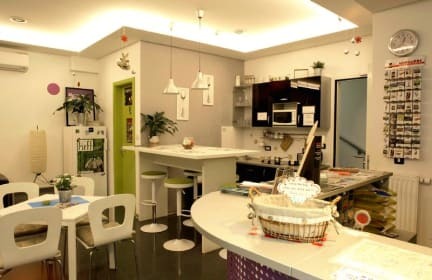 Hostel Chic Zagreb is a new, modern and sophisticated hostel located in the centre of Zagreb, within a short walking distance to the most important tourist attractions. 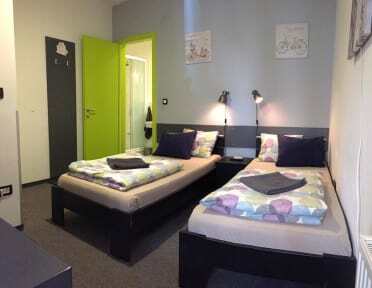 Hostel Chic Zagreb is situated near the main railway station and main bus station. It offers 6 rooms for singles, couples or families. There are 3 types of rooms, double, twin and dorms. All double and twin rooms have private bathroom and TV. Dorms are for 6 and 8 people with common bathroom. There is also common lounge area with TV, free internet access and small kitchen. The rooms are equipped with personal reading lights and backpack size lockers. There is air condition in all rooms, reception hours 8am - 11pm. There is also possibility of late check out. I stayed here for a few days with my family. It’s a nice, clean quiet place with a very convenient location. The staff is friendly and helpful. Perfect location, free towel, spacious shower and good pressure, hairdryer, lovely staff and dog haha, comfy beds, power point and light for each bed, balcony and it was nice and quiet at night. Definitely recommend. Clean, safe and cutely decorated hostel. Convenient location - not too far from the train and bus station and fairly close to the old town. Cute doggie greets you here! So great! 400m from train station. Clean and tidy/new. People where mostly quiet so you could sleep soundly. Comfy beds clean showers good pressure no issues. Lovely hostel: quiet, great facilities including big lockers and hairdryer, enormous balcony, exceptionally clean, central location, polite and helpful staff and a very nice dog. Will stay again. I had a great stay at Hostel Chic. Centrally located in Zagreb. The staff were helpful, facilities are clean and I love the interior designs.. Would recommend a stay here for sure. Close to the old part of town without being right in it, and tucked away in a courtyard so it's not noisy (no accounting for fellow travelers though!) The bathrooms were on the small side so maybe expect a wait during the busy season, but everyone there was lovely. The location is great 15 minutes of walk from the main bus station and city center attractions. The staff was really friendly and helpful. I was in a private room, the size was good and the shower work well.